Welcome to the first installment of a monthly collaborative photo project I am thrilled to be participating in with several talented photographers. This project concentrates on focusing on our everyday moments. Together we will share our images at the end of each month focusing on various sub-themes related to the over-arching theme of Everyday Moments. As we all know, life slips by very quickly and the images shared will be small glimpses into our everyday lives. It also provides us a place to share images that may or may not be technically perfect, these are the ones that pull at our heartstrings. I invite you to follow along with me on this project. Our first theme is "new beginnings." I chose the following image for several reasons. One of them is that I have made a goal of trying to get into the frame more often. I have a bazillion images of my children, but not very many of us together. So, one of my new resolutions is to get in front of the camera once a month. Another reason I chose this image is that we are starting a new gardening project with our kids and journaling our discoveries as we grow our own vegetables this summer. 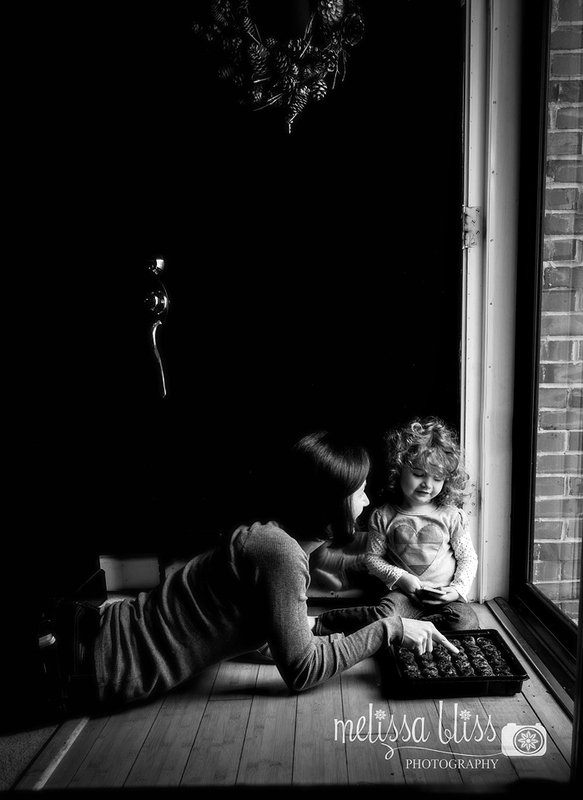 We have just planted the seedlings, and in this image my youngest daughter and I are checking out the tiniest sprouts before we set them out in the sun for the day. One of my greatest joys is watching the sparks of wonderment in the eyes of my children as they make new discoveries about this great big world we live in. Thank you for visiting today! To see more of our project, please visit the next blog in our circle hosted by Crystal. And be sure to check back next month for the second installment of Project 13. She will look back on this photo, and be so happy that you are in it!! Lovely photo as always. What a great shot! It's such a dramatic black & white! Love the dark shadows! Seriously STUNNING shot my friend! This is such an amazing photo! I know your daughter will love looking back at this photo one day. Definitely a keeper - what's another word for stunning? what a great memory this will be! stunning! and I love it in black and white! i should do the same, i find i'm not in too many photos!! Lovely photo of you and your daughter together! What a special memory.